Allie Hunters Tours offers 3 types of tours in and around Sydney – Reef Fishing, Sports Fishing and Game fishing. Along with this Allie Hunters offer harbour tours. Reef Fishing – Sydney offers some very exciting estuary (within Sydney Harbour) and reef fishing (from Longreef to Bondi and up to 5 miles offshore). You never really know what you’re going to catch. Estuary and reef fishing is available all year round and most of the species make excellent eating. 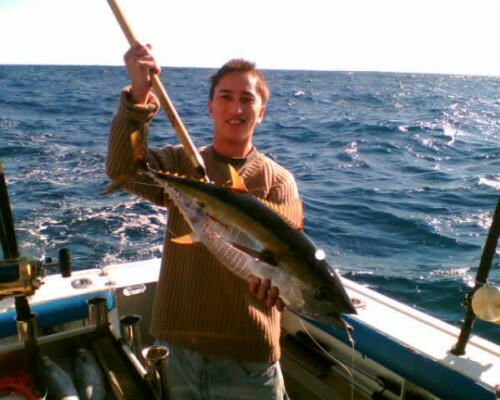 You can expect to catch Snapper, Morwong, Trevally, Kingfish, Jew fish, Leatherjacket…. and the list goes on and on! 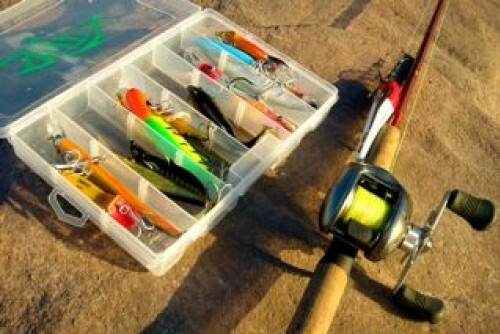 Sports Fishing – Sport fishing is perhaps one of the greatest challenges that faces the modern angler. The aim is to catch as-big-a-fish as possible, on as-light-a-line as possible. The aim of the game is to catch the largest fish possible on the lightest of lines. We offer this challenge to our clients by enabling them to catch some monster Mahi Mahi. Also known as Dolphin fish these species are spectacular, aerobatic fighters. Freshly caught, they lights up in beautiful shades of green and yellow. Allie Hunter is able to catch Mahi Mahi on demand! We have our very own FADs (Fish Attracting Devices) laid in deep water a number of kilometres off Sydney… sorry, the exact whereabouts is secret! Although clients can use any rod and reel they wish, we recommend using 6Kg line class for the true sport fishing experience. We chase these fish using livebaits, lures and soft plastics. Game Fishing – The Sydney offshore fishing grounds offer some of Australia’s best gamefishing that provides a variety of hard-fighting species. Blue, Black and Striped Marlin are all available from November through to May each year. The cooler months of the year offer large Yellowfin Tuna, Bonito and Sharks. The skipper, Hovig, practices and actively encourages ‘Tag and Release’ for all species of marlin. Alongside is a beautiful Striped Marlin that is about to be released. The yellow tag can be clearly seen left of the gills along the lateral line. The tag has a unique numerical identifier that records the angler, date and location of capture, approximate size of the fish, and the name of the vessel. Departure Point: The Spit at Watson, Rose Bay , Darling Harbour, Manly Wharf and Watson’s Bay – or anywhere in the harbour. Return Time: 1:00pm (morning session) 6:00pm (afternoon session), after 4pm (Game). Inclusions: Rods, reels, bait. Please BYO food and drink. We can supply catering on request. Please contact us for catering pricing. We can pick up and drop you off anywhere in the Harbour. Allie Hunter Charters specialises in big game fishing, reef fishing and sport fishing, but we also cater for Sydney Harbour cruises. We operate out of Sydney Australia, and we pick up anywhere in the Harbour. Fishing in Sydney and Sydney Harbour cruises are what we do and we can offer 2 game fishing boats catering up to 20 people- 10 per boat. 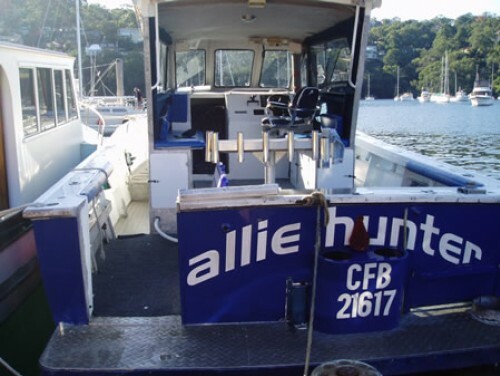 Allie Hunter is a specialist game fishing and sport fishing vessel. She is a custom built 34ft flybridge centre cab vessel with an unobstructed waist-deep, walk-around deck. Allie Hunter is a high speed (cruises at 20 knots), plate alloy monohull featuring a comfortable four berth with all amenities. She features state-of-the-art electronics. Tackle (Shimano reels) and bait is supplied for all charters – bring your own refreshments. Catering can be organised for an additional cost. As for safety, she has a liferaft, EPIRB, GPS, Chart Plotters, UHF and VHF radios. The skipper has fished all his life including Cairns in the north to Bermagui in the south where he and his team have won numerous big game fishing tournaments. 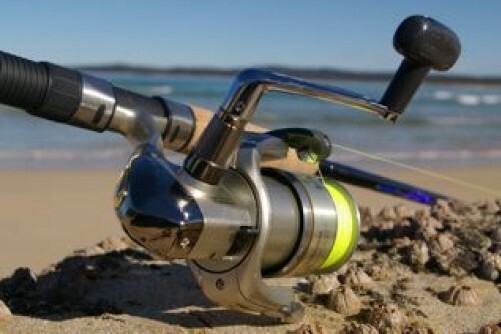 If its a fishing charter in Sydney you want, we are the people to call.